119 registered members (2009Edge, 1978elcamino, 28oz, ad244, 53' Stude, 2dogs, 9 invisible), 2,130 guests, and 26 spiders. 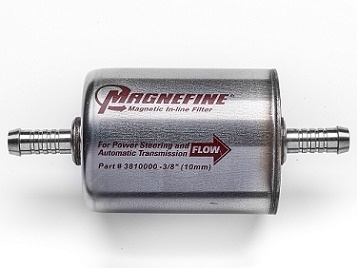 I recently did a pan drop and filter change on my moms Impala and obviously cleaned the pan and magnet; at that time, I because aware of the TSB GM has about replacing the stock magnet with an improved one and adding another to the bottom of the filter. I had already buttoned the trans back up before I could get the new magnets. I'd like to add a rare Earth magnet to the outside of the pan just to see if it helps keep metal off the solenoids, which is the entire point of the TSB. For anyone experienced with these GM FWD transaxles, where would the safest spot be on the outside of the pan to put a magnet, or even 2??? I don't want to put it close to where the OEM one is and mess it up. I certainly don't want to get a magnet close to any electronics in the trans and fry them. Thanks! Has anyone done this to a GM or any other type of car??? Last edited by Drew99GT; 08/27/17 06:16 PM. There are no electronics/solenoids in the bottom/lower pan on a 4T65E, They are in the side pan. Buy putting them on the outside of the pan, You will lose a lot of magnet surface area for the debris to cling to. If your worried about this, Pull the pan & do it right! However......You cleaning the original magnet is satisfactory 'til the next service. The issue is that the Pressure Control Solenoid attracts metal particles & messes with solenoid response to amperage input from the PCM, Whatever metal is stuck to the PCS already is not going to fall off just because the extra magnets. Around 2002 GM switched from a Holley sourced PCS Solenoids to a Borg Warner sourced solenoid. The Holley part was far better shielded/insulated from attracting debris, But it was more expensive. Why in heck did gm not put this ? Cause the cheap fittings they'd use would leak all over the place! As those inline filters load up, your flow in/out of the cooler is diminished. You have to change them regularly.The strongest magnets I have tried came from the magnetron of a microwave oven. You have to pry them off the pan with a screwdriver. As posted, you lose a lot thru the pan. I found out you are still far better off even with the stock magnet over anything you can put on the outside of the pan.I did install two of those improved magnets, the improved one is far superior to the square stock one in strength and surface area. Last edited by Lubener; 08/28/17 04:44 AM. Exactly, they probably decided against having the possibility for another leak point in the system, and something else to service. Oh and the added cost. I remember Avweb did a test on rare earth magnets on the outside of standard champion filters once. They found that the magnets really did grab up metallic debris and lock it to the inside of the pan behind the magnet. The testers were pretty impressed. Those were only tiny 3/4" neobendyum magnets so a bigass microwave magnet should work well outside the pan. Not as well no doubt as inside naturally but still very helpful..
Well u cud go to an auto store and ask them to see a similarly constructed pan and right at their counter stick the magnet on the outside and see if it will attract a new nail or something mettalic on the inside of pan with force.